Affiliate Links // Some products were sent to me courtesy of the brand and are labeled as “c/o”. As a petite person, I get a lot of interesting advice on how to dress. I’ve been told skinny jeans make me look like a lollipop. (This is probably somewhat true, but they also make me look much taller. 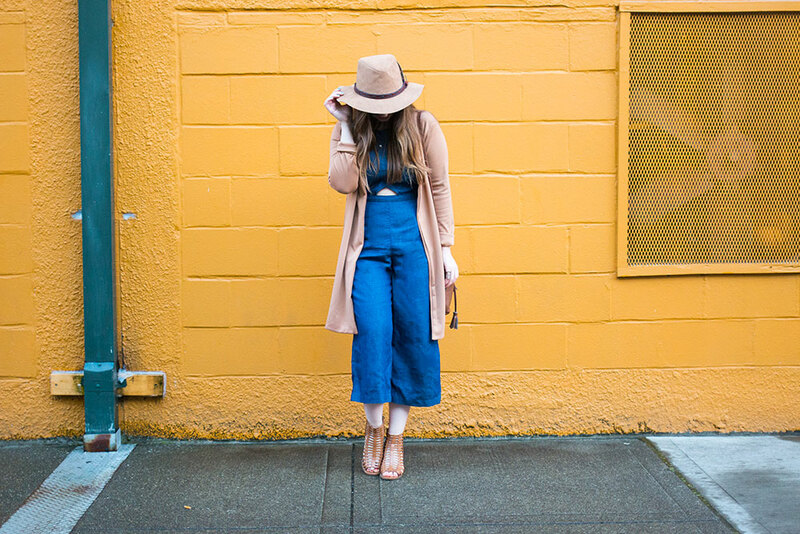 I’ve heard that culottes (let alone a culotte jumpsuit outfit! The horror!) are the ultimate no-no because the awkward place they land on my calf will make me look short and wide. Oh, and that maxi dresses will never be the right length. Ever. (Which is just not true. I wear them all the time.) What I’m getting at here is that I’ve received a lot of crappy advice about how to dress, despite potential well-meaning intentions. I thought today I would break all the rules, because, well, I can. Hat: Alchemy Safari Hat in Camel c/o Brooklyn Hat Co. When culottes started making a comeback, I cringed. All of the horrifying memories of the gaucho pant from high school came back. I never had them, but boy did all of my friends. I did, however, try them on once and I remember the horrified looks and the ‘no way, those look terrible!’ giggles. So, I gave up my stretchy knit gaucho dreams and soldiered on in my denim capris. Womp womp. Back in high school, I was much more self-conscious when it came to dressing. I definitely had my rebellious moments, though; I recall a certain mini skirt that I DIY-ed with patches and distressing that horrified my mom, and I promptly pulled up as soon as I got to school so that it was even more scandalous. Oh to be 14 again… But really, I was a pretty vanilla dresser (and still am, most of the time) and always played by the rules. The real test came this weekend when I met up with some blogger friends. Were they going to think I looked like a lunatic? Or like I got lost on the way to Coachella and really shouldn’t be wearing this in public? I was relieved when they said, “That’s from Target? !” in the best way possible. So, it got the blogger nod of approval, and I was stoked. I think the key for me in pulling off this jumpsuit really comes in how it’s styled. On its own, it’s a little different. Breaking the look up with a jacket (and also, to keep warm because it suddenly got chilly here and I’m not liking it!) and other accessories kept it looking modern. 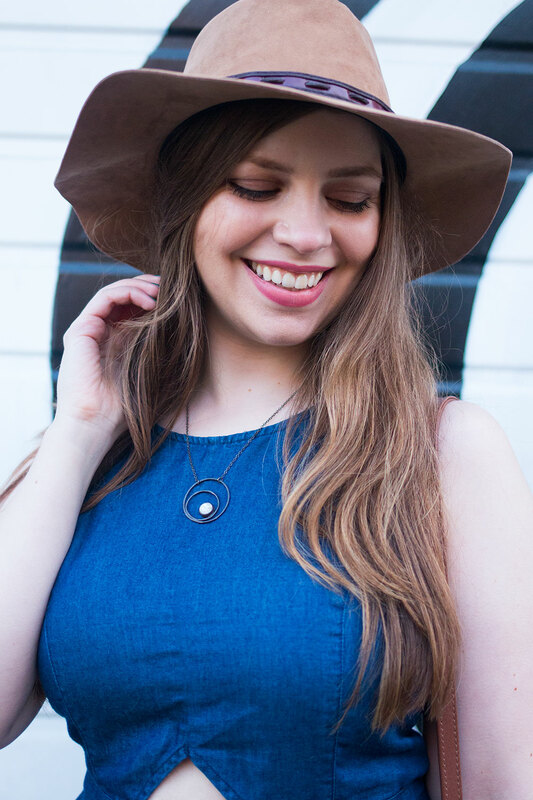 The thing about accessorizing a piece like this is that you can take it from looking like you belong at Coachella to a casual weekend to an edgy night out in 30 seconds flat. 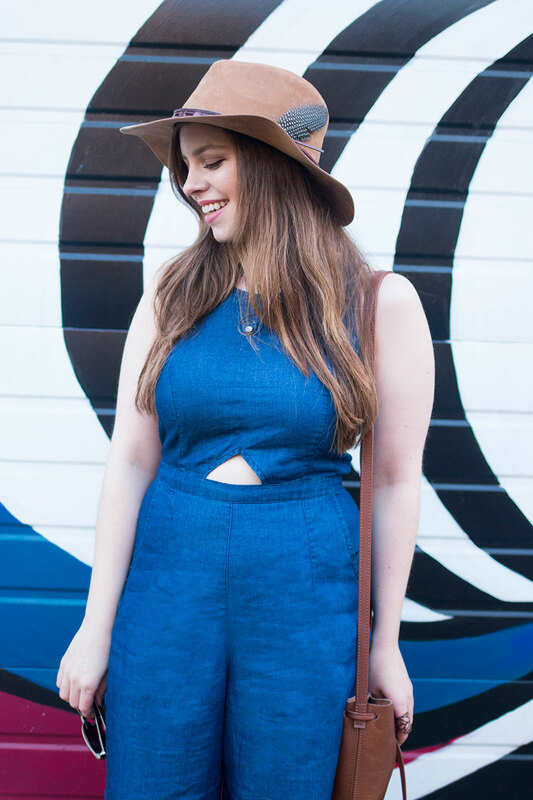 Have you created a culotte jumpsuit outfit of your own yet? Are culottes on your radar for spring and summer? I’d love to hear about how you’d style them in the comments! I am dying for this outfit! I have been toying with the idea of getting one and now I’m sold. Looks darling on you, Jenn! Aw thanks Portia! You should definitely get one, they’re so fun to style! Aw, thanks so much Kaeleen! 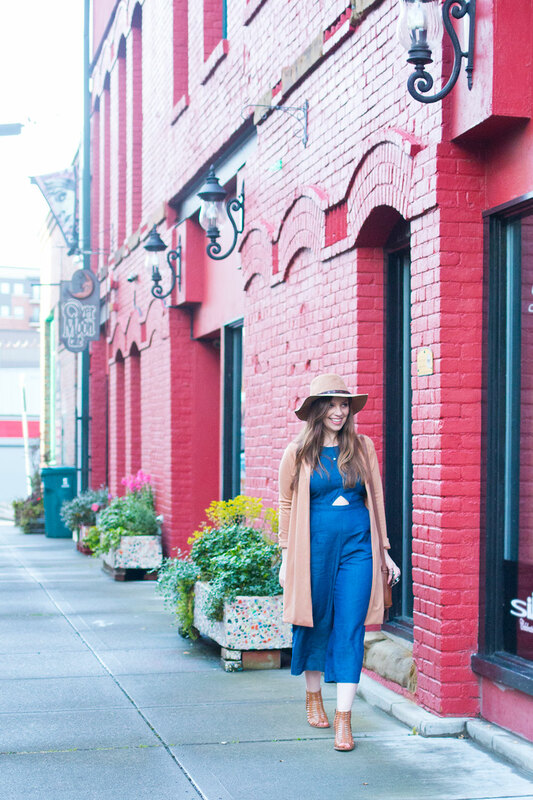 I’ve found that jumpsuits with cuffed bottoms are also great for us that are petite. You can always roll elastic under so that it looks like a normal hem! Ann Taylor Petites…waiting impatiently for them to arrive in the mail! Ya seriously, good job Target! You look awesome. 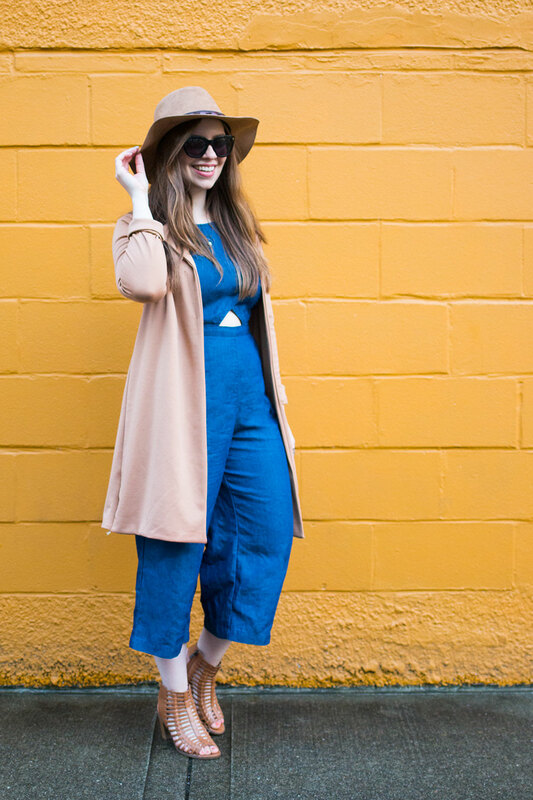 I’m still in the unsure side of the fence with culottes and jumpsuits for myself but I want this outfit. Such a mod look! I LOVE it with that hat! You look great! 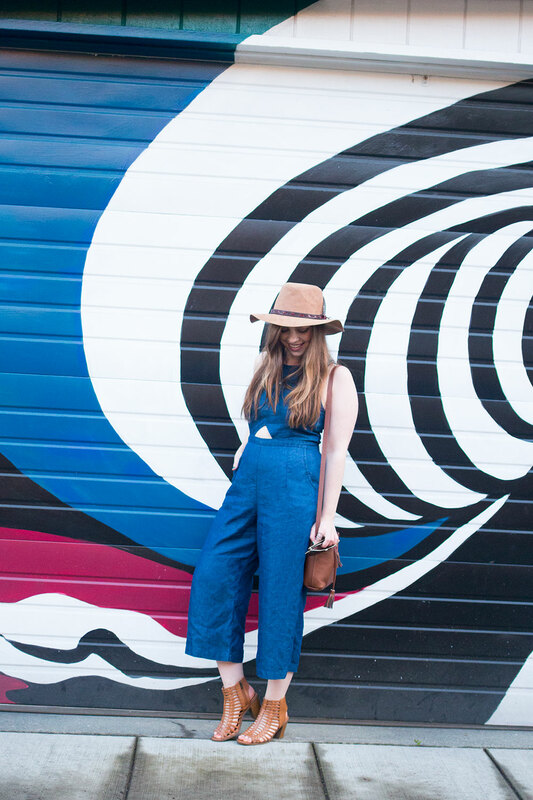 I have two pairs of overalls but culottes just remind me of homeschool moms from my youth but this one is so stylish and looks retro in a good way. Can’t wait to read more of your outfit posts! You look great, that culotte jumpsuit is such an interesting piece and I really like the shoes. Haha, I know right?! And it ended up being my favorite that I’ve posted in awhile!